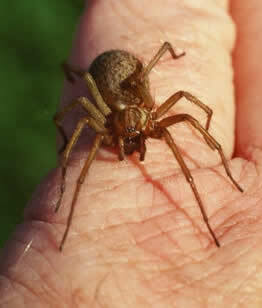 Hobo Spider (Tegenaria agrestis) , photo by Robb Bennett. The invertebrate fauna of British Columbia is diverse, and includes all animal species that lack a backbone or a bony or cartilaginous internal skeleton, such as spiders, butterflies, snails, and even such large marine animals as octopuses and squids. E-Fauna BC provides introductory information on the invertebrate groups that are found in BC where these have been studied by experts and detailed information is available. Cursor over the Invertebrates of BC heading in the menu on the left to see which introductions are available. This section does not include insects, which have their link in the menu on the left. Special features in the Invertebrate section include an introduction to the earthworms of BC, glass sponges of British Columbia, and an introduction to the marine invertebrates of the province.